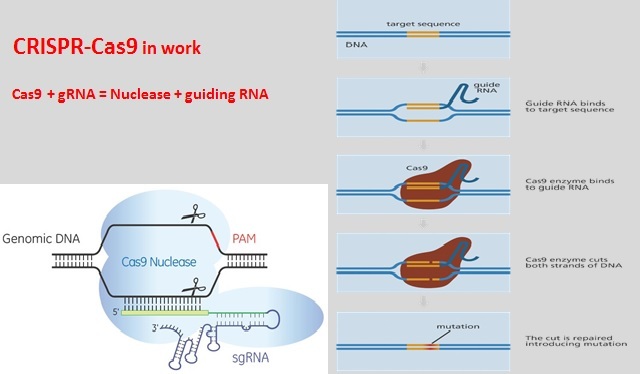 from CAS and CRISPR, comprising said nuclease and usually two RNA molecules, is able to find the foreign DNA complementary to said samples and neutralize it by cleaving. The system is now popularly utilized in a genome editing technology known as CRISPR-Cas9 which enables to modify genes in any organism much more quickly and simply than the previous techniques such as ZFN and TALEN. Jennifer Doudna (California University in Berkeley, born 1964) and Emmanuelle Charpentier (Max Planck Institute for Infection Biology, born 1968) re-engineered bacterial components into a simple system comprising one RNA segment and protein Cas9; the RNA guides (gRNA) the cleaving enzyme Cas9 to any complementary DNA and cuts it in both strands; the free ends enable to modify the DNA as wished (using HDR, NHEJ, etc.). 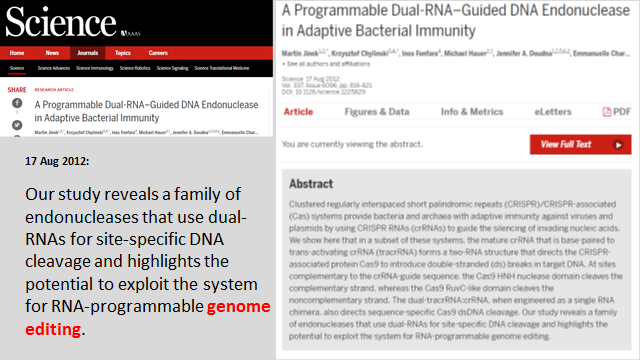 Doudna and Charpentier published their work in Science in August 2012. 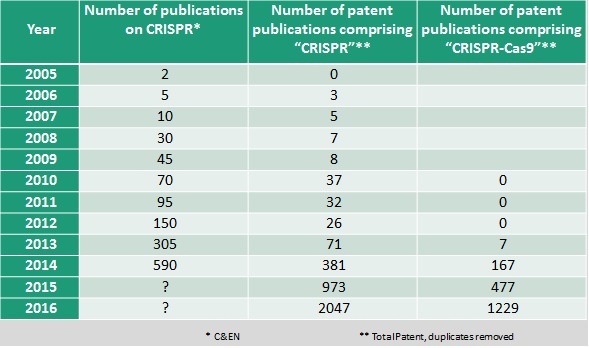 An explosion of CRISPR published works followed, firstly scientific publications and later patent applications, utilizing CRISPR-Cas9 for modifying human cell cultures, yeast, mice, monkeys, and human embryos. Commercially available CRISPR-Cas9 systems and working protocols quickly appeared (Sigma Aldrich, Nature Protocols, etc. ), and "democratization of gene editing occurred". The potential of CRISPR-Cas9 was immense. Doudna started her company Caribou Biosciences already in 2011, and with Charpentier they filed a provisional patent application in May 2012. In 2015, U.S. teams announced using CRISPR in creating a "mutagenic chain reaction" that was able to stop the mosquito susceptibility to host malaria, and they even made modifications rendering female mosquitoes infertile, thereby possibly wiping out the whole population. 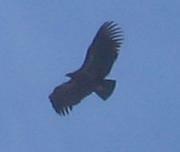 Wiping out human subgroups can be easily envisaged. Doudna and Charpentier became famous overnight. 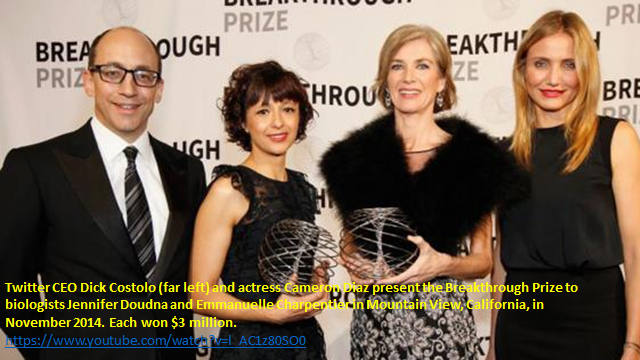 In November 2014 they received the $3 million Breakthrough Prize, competing against the Nobel (4-10 times more money), created by the Internet billionaires including Yuri Milner (Internet), Mark Zuckerberg (Facebook), Sergey Brin (Google), and Jack Ma (Alibaba), etc. Time Magazine named them among 100 most influential people in 2015. When Doudna studied, she already had been supervised by two Nobelists, Szostak (telomeres) and Cech (catalytic RNA). From 2013 on, also the two women, Doudna and Charpentier, were expected to get a Nobel Prize. Her famous University of California in Berkeley, of course, supported the publicity. Although the University is generally known more for its hippies history of the Sixties, the California University in Berkeley, as well as the Lawrence Berkeley National Laboratory connected to the University, have surely achieved great successes. Look at the elements in the Mendeleev Table, Am (americium), Cf (californium), Bk (berkelium), Lw (lawrencium), Sg (seaborgium), and other, created there, Lawrence and Seaborg being the directors of the National Laboratory and Nobel prize winners as well. 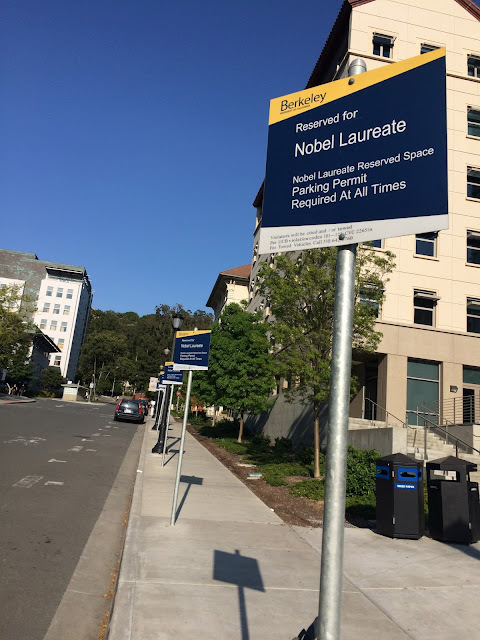 Nobelists are indeed appreciated in the Berkeley university, and inside the university where at nine the morning nobody can find a free parking lot, they even have the most precious valuable – a reserved parking place for every Nobel prize winner. Natural sciences are supported in Berkeley, and famous is the Lawrence Hall of Science for children and adults located at a charming site on the hills between the University and the Laboratory, from which a wonderful view of the whole city of Berkeley can be enjoyed, with the bridges of San Francisco and the Pacific in the background. Look at a climbing toy in the shape of the DNA molecule at this site; my grandson Dan climbs it and makes a DAN AND DNA complex. The Doudna’s US provisional patent application proceeded to an international application PCT as is usual, and slowly also to national patent applications in other countries. 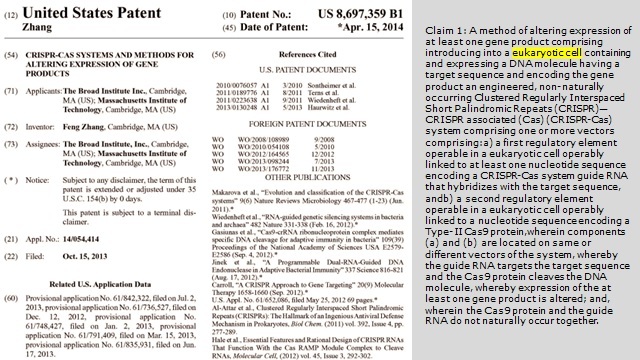 It came as a shock and caused consternation, when on 15 April 2014 a US patent was granted on CRISPR/Cas9 technology, US 8697359, to a 32-year old inventor Feng Zhang working in Broad Institute and MIT, Cambridge, Massachusetts. Although generally unknown, the young scientist (born 1982, linked to Stanford, Harvard, and MIT) had been among the most hyperactive and successful ones in the wave following Doudna’s 2012 publication. He coauthored a 2013 Science publication describing the use of CRISPR-Cas9 in Eukaryotic cells, as well as tens quickly filed US provisional patent applications. In 2013 Zhang cofounded Editas Medicine together with Church and Doudna, but Doudna broke off after the Zhang’s patent had been granted. Her rights in her own pending patent have been licensed to Intellia. In the meantime, Charpentier cofounded a startup CRISPR Therapeutics in Basel, Switzerland, selling her rights in the patent application to them. Other companies have since been formed. The companies raised hundreds of millions of dollars to turn CRISPR into cures for incurable diseases. Granting a patent to Zhang was totally unexpected. Firstly, from filing the provisional to the grant took only 1 year and 4 months. Secondly, Zhang claimed the use of CRISPR-Cas9 in eukaryotes, which was seen by many as a particular use of Doudna’s general technology. Doudna expected in her earlier work that the technique would work in all cells as well as in bacteria, but according to Zhang this was a mere conjecture and he was supposedly the first to show that it really works, concluding that his work was an act of surprising action – an invention. But the fact, that many scientists quickly managed to get CRISPR technique to work in eukaryotic cells, together with excellent reproducibility of the method in different organisms, might have suggested that CRISPR would have worked in all cells. 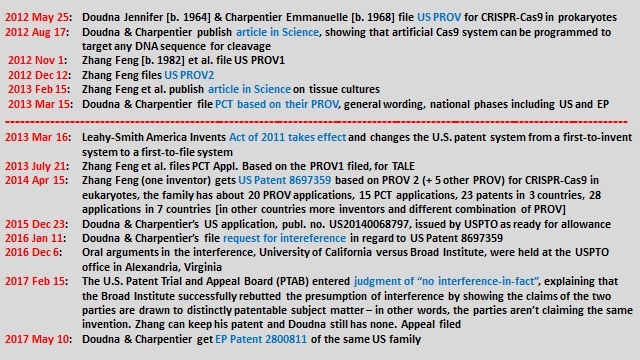 As there is no patent opposition procedure in the U.S. (in contrast to Europe), Doudna decided to challenge the Zhang's patent by utilizing the interference process – a procedure in patent examination having existed only in the U.S., and having been abolished with the passage of the Leahy-Smith America Invents Act in 2011 by Congress. In case of two independent inventors competing for a patent, the U.S. patent law traditionally used to give priority rights according to a first-to-invent system and not a first-to-file system; the interference proceedings used to decide who was the first to conceive the invention and to reduce it to practice, regardless who filed the application as first. The Leahy-Smith Act set 16 March 2013 as the last filing date of a patent application which can utilize the interference proceedings. Doudna’s provisional patent application was filed on 25 May 2012 and her PCT application on 15 March 2013 – interestingly one day before the last day. The patent dispute over the Gene Editing Technology between the Broad Institute Inc. vs. The Regents of the University of California was seen as one of the biggest litigations in the biotech history, and in any case it was probably the last important interference case in history. Zhang’s application was filed half a year after the Doudna’s application, but it was prosecuted quicker thanks to Zhang’s attorneys who filed Petition to Make Special, enabled when the patented subject is related to environmental quality, recombinant DNA, superconductivity materials, HIV, cancer, countering terrorism, and others. In the meantime, Doudna’s attorneys added amendments to the patent application to cover the use in human cells; in September 2015 an Official Action (OA) raised a number of rejections of the claims; in October the applicants’ attorneys conducted an interview with the examiner, untypically participated by four examiners, showing that the USPTO was aware of the importance of this case; in November a response to the OA was filed, and on 23 December 2015 the USPTO issued a notice of indicating that all of Doudna’s claims were in condition for allowance. Instead of taking a patent, Doudna et al. filed a request for Interference in January 2016, and it was granted. The three-judge panel should determine the priority of invention between the disputing parties, as well as the patentability of both inventions. The burden of proof to establish earlier inventorship lied with Zhang (junior party). The junior party won in about 43% of cases in the US patent history. It had to be shown that the inventor had proceeded to reduce the invention to practice without further inventive activity and with sufficient diligence, usually demonstrated by detailed and dated laboratory notebooks. Doudna’s team demonstrated the mechanism only in bacterial cells but claimed all types of cells in the US patent application, and examiners accepted Doudna’s claims as allowable. Zhang’s claims were limited to the use of the CRISPR-Cas9 in eukaryotic cells, and Zhang’s examiners acknowledged that the extension to eukaryotic cells was not obvious. During the oral hearing on 6 December 2016, UC Berkeley’s lawyer argued that Zhang’s accomplishments in eukaryotes were an obvious extrapolation of Doudna and Charpentier’s work, and the Broad’s lawyer argued that Zhang’s achievement was inventive and not obvious. Moreover, in order to show he was "first to invent" the use of CRISPR-Cas in human cells, Zhang supplied lab notebooks, as was usual in the interference cases; the notes allegedly showed he had the technique ready before Doudna and Charpentier published their results or filed their patent application. Generally, it was expected that Doudna’s team would prevail in the interference proceedings. For many surprisingly, on 15 February 2017 the US patent office (USPTO) ruled on a patent interference case brought by University of California with respect to patents issued to the Broad Institute, and found that the Zhang’s patent was distinct from the Doudna’s invention, the two techniques not competing and being separately patentable. The USPTO thus pronounced a judgment of “no interference-in-fact”, stating that the Broad Institute had rebutted the presumption of interference by showing the claims of the two parties are drawn to distinctly patentable subject matter, so that the parties do not claim the same invention. With billions of dollars in the air, the Patent Office was afraid to deliver a verdict, which would be fateful for any one of the two parties. The ruling left Zhang with his patent and Doudna merely with her application. On April 12, 2017, the University of California-Berkeley filed notice of appeal with the US Court of Appeals for the Federal Circuit in Washington, DC, challenging the February ruling. On May 10, 2017, Doudna et al. got a patent in Europe in this patent family. As of June 2017, Zhang had about 27 patents, Doudna and Charpentier about 6. Many questions have been raised. How does it come that Zhang is the only inventor of the granted US patent, when many co-workers probably participated in the work? 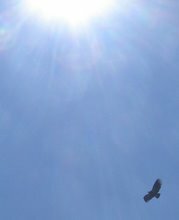 How was it possible to grant patents (in several countries) to two parties who claim the same invention or whose inventions overlap? Was Doudna’s decision to go to the interference procedure not a tactical mistake, as the US patent office is now afraid to grant a patent to her before the appeal is decided, and she remains with empty hands (in the U.S.) for the time being? Can Doudna and Charpentier get a Nobel Prize when they got the Breakthrough Prize? Can Zhang get Nobel Prize, when he seemed to be only second after Doudna? The most important question is, to whom should the investors of billions of dollars pay for the license when utilizing the invention? It can be noted that beside Cas9, there are Cas1 and Cas2 and many other systems in the innumerable bacteria and archea, which may replace the patented systems, and the gene editing technologies of tomorrow might do without the techniques patented in the disputed patents. The appeal result is keenly expected.